Charles Darwin, born February 12, 1809. 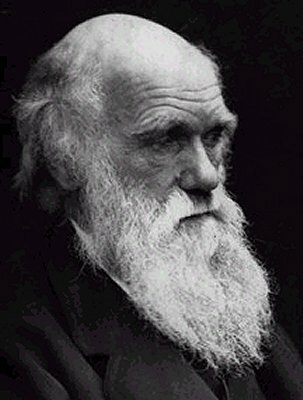 Charles Darwin was born on February 12, 1809–the same date as Abraham Lincoln, and a few weeks after Edgar Allan Poe. His most important work was of course The Origin of Species, first published in 1859 and still in print today. He wasn’t the first scientist to write about evolution—that idea had been in the air for decades—and he wasn’t the first to recognize the vast age of the Earth. His contribution was the first coherent and largely correct theory of biological evolution. Darwin was a careful, meticulous observer who tried to back up every assertion he made with multiple pieces of evidence. In essence, he was always saying “don’t trust me because I say so, trust me because the evidence supports me”. One chapter of Origin of Species is “Objections to the Theory”, in which he lays out a lot of ways he could be wrong. He even anticipated some of the arguments made today by “Intelligent Design” advocates and showed them to be fallacious. After 102 years, biology has only strengthened the case for evolution, building on Darwin’s work to produce something much grander than anything possible in 1859. It could easily have not been the case: genetics could have brought down evolution, but it didn’t—genetics stand as one of the strongest pillars in support of evolution. Paleontology could have refuted evolution, but it didn’t—the evolution of birds from some dinosaur species and the descent of land-dwelling vertebrates from fish are very well mapped, along with the evolution of whales from land-dwelling mammals, snakes from legged reptiles, and so on. In other words, though we scientists are sometimes accused of worshiping Darwin and often Creationists will attack the man himself, it isn’t about Darwin in the end. As far as I can gather, Darwin was a decent man over all (though as I said in my earlier post, nobody is perfectly admirable in every way and we shouldn’t expect them to be), but even if he had been a total scumbag that doesn’t affect the correctness of his theory. Many good people haven’t managed to contribute anything important to science; some unpleasant sorts have produced towering scientific achievements. Science is a human endeavor, tied to culture and history, yet the heart of science lies in testability–something that stands apart from individual personalities. So, celebrate Darwin today if you choose, but even more than that—celebrate science and the human achievements that have led to great understanding of our wonderful world and universe.